Everyone knows that the holiday season can put the pressure on for gift-giving. Not only are you responsible for finding the perfect gifts for your friends, family, and significant others, but many times you end up stuck in a company “Secret Santa” gift exchange where you have to find the perfect gift for a co-worker you barely know—bummer. But, what do you do when you think your co-worker cheaped out on your gift and didn’t spend the $50 limit? Well, normally, the limit is there so people don’t go above $50—it’s not a number that they are supposed to hit. Some people opt to get $50 gift cards to stay on target, but, others try to make the gifts somewhat personal and thoughtful. However, one mother proved that some people are truly outrageous and greedy after she discovered a co-worker who was her “Secret Santa” spend below the $50 limit. Seriously, the balls on this lady. The woman started out by thanking the co-worker for the blanket and chocolates they had given her. 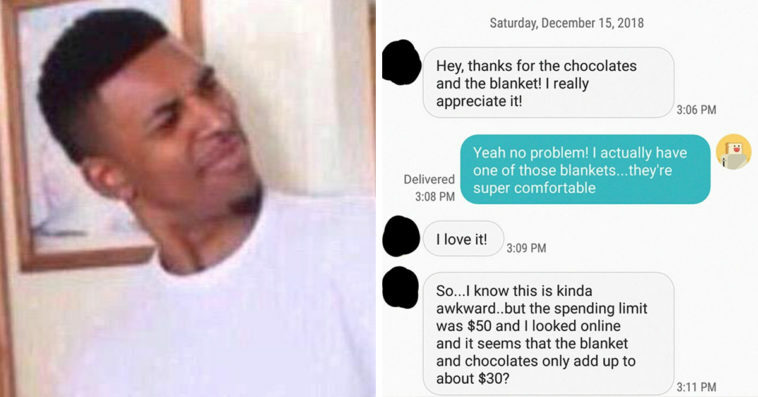 But, she then disclosed that she looked up the blanket online—and the chocolates—and found out it only came out to $30. She then said that she wanted something else, blaming her kids for her lack of money. The guy even offered to get her something else worth $20 (why? I’m not even sure). But, she had the balls to ask for a tablet worth $120. Obviously, that’s way over the $50 limit. She then decided to guilt her co-worker into getting her the tablet for her because he “makes more than she does.” She said if he didn’t want to get the tablet she would take the $120 in cash—so kind of her. After the co-worker explained, calmly and kindly that $120 is above the limit and above his budget for a gift, she decided to go ape-sh*t on him. She told him he’s “disgusting” and then, asked for the extra $20 in cash. By this point, her co-worker was completely done (and rightfully so). People online were pretty disgusted by her behavior.